1) With the scissors and the old giftcard, follow the diagram and cut out 4 triangles. The two larger ones (purple) should be even in size with each other. The two smaller ones (light blue) should be even in size. If you want, use the marker to draw the shapes on the back of the giftcard before cutting out your triangles. Set the large scrap (blue) piece aside for future projects. 2) With the emery board, sand the edges, round the corners, and rough up the front and back sides of each triangle. Rub the filing dust off. 3) Squirt a thin even layer of E6000 glue on the back of one small triangle. Press this down in the center of one large triangle. While the glue is still fresh, you can wiggle the small triangle around to re-position it. Press down gently and use your fingernail to gently remove any excess glue. 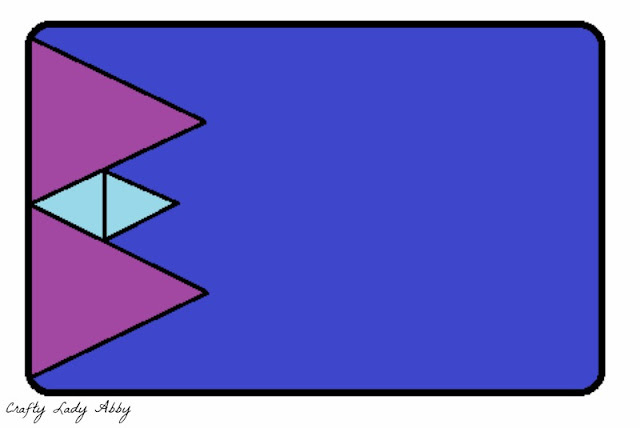 Do this for the other two triangles too. Let the pieces dry for about 30-60 minutes. 4) After the pieces have dried, Use the marker to place a centered dot toward the top of the flat edge. Do this for both earrings. These serve as indicators for drilling the holes for the earring hooks. 5) Put the old magazine or phone book down on your work surface. Place the triangles onto the magazine or phone book. Using the Dremel with the 5/64 bit in it, on a low setting, drill a hole through each earring where those dots are. Use the emery board to sand any rough spots across the holes. The pieces have been glued together and drilled. 6) Head outside with your trash bag, black plastic spray paint, chrome spray paint, sponge brush, paper plates, and earrings. Spread the trash bag down on your work surface. Place your earrings face down on the trash bag. Spray the earrings with the black spray paint. Carefully pick up the earrings by the edges and place on a dry spot of the trash bag. Let the earrings dry. I had a lot of problems with the drying, because paint kept seeping under the pieces as they were drying and the humidity wasn't helping either. This is usual for me. Don't fret about it being perfect, because the chrome treatment will disguise some imperfections. 7) Flip the pieces over. Spray paint the front sides black. Carefully move the pieces to a clean spot on the trash bag. Let the pieces dry. Excuse the crappy paint job...sigh. Real metal is textured sometimes right...yeah. 8) Set a paper plate aside. Spray a small amount of chrome paint onto this plate. Dip the sponge brush into the chrome paint on the plate. Pounce the brush on a clear spot on the plate to get some of the excess off the brush. Place one of the earrings in your hand, face down. Pounce the sponge brush onto the earring back. You'll get paint on your hand, but you can scrub this off later. You aren't trying to cover up the black fully. You want some of it to show through, for the aged effect. Reload the brush with paint as needed, making sure you pounce off some excess paint before adding paint to the earrings. You can spray more paint onto the plate if needed too. The paint dries fast, so only spray a small amount at a time. You aren't trying to cover up the black fully. You want some of it to show through, for the aged effect. Here is what my paint plate looked like. The solid chrome circle is the old paint. The circle layering that one is what freshly sprayed chrome paint looks like. The zig zag section is where I've pounced off excess paint. The splatter is from spraying the paint onto the plate. You can see there is just a little paint on my sponge brush. Paint both earrings like this, and place them on a different paper plate, chrome side up. Let the paint dry. When they are dry, flip them over and paint the front sides the same way. Place them on the plate to dry. You can wash the paint off your hands while the earrings are drying. The earrings should look like this when you are done pouncing on the chrome paint. I painted all of mine at once, but if you are only making the pair in this tutorial, you can see them at the bottom of this photo. 9) Take the pieces and supplies, minus the trash bag, inside. Place the newspaper or folder on your work surface. Place the stacked triangles earrings down onto that paper. Mix your glitters into the small container, stirring them with the plastic spoon. Set your clear nail polish bottle and small soft paint brush on this work surface. 10) With the clear nail polish, paint an even layer of polish on the center of one triangle. With the spoon, scoop up some of your glitter mix and generously sprinkle it on top of the wet nail polish. With the back side of the spoon, press down gently on the glitter. Pick up the piece and gently tap off the excess glitter onto the paper. 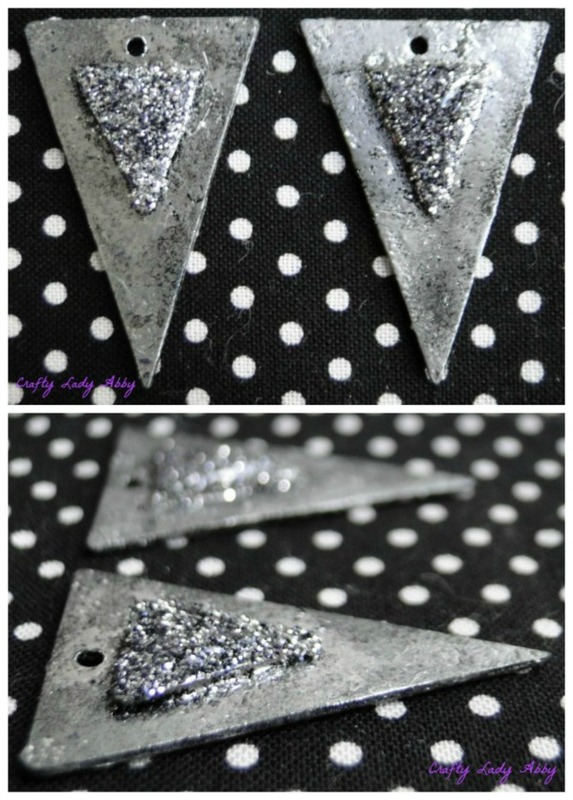 Use the soft paint brush to gently dust off any excess glitter that is around the small triangle. It's ok if you can't get it all off. If you've used neutrals, metallics, or colors that match the finish of your pieces, it's unlikely anyone will notice any random glitter flakes. Do this to the center of the other triangle too. Let them dry for about an hour until hard. Repeat Step 10 once more, to deepen the glitter effect. After this 2nd polish/glitter layer has dried, paint on a last coat of just clear nail polish to seal in the glitter. After this layer has completely dried hard, you can use the soft brush to dust off the excess a glitter a little harder. Though, again it's ok if you can't get it all. This is how the pieces will look after you've added the glitter centers. 11) Fold the paper in half and pour any excess glitter back into the container for the glitter mix. You can tap along the paper crease to shake the glitter down. Use the soft paint brush to also help brush the glitter down into the container. It's ok if you can't get it all. Glitter likes to cling to everything!!! You can store this somewhere for other projects. 12) Get the 2 pliers, 2 jump rings, and 2 earring hooks. I use the two plier method when working with jump rings. With the 2 pliers, open the 2 jump rings. Slip one jump ring onto the hole of one piece. Slip the loop of one earring hook on that same jump ring. Using the two pliers, close the jump ring. Do this for the other earring too, but make sure the earring hook is faced the other way when you slip it on. Once you've done this step, YOU ARE FINISHED!!! These are what the earrings look finished. This pair of earrings is finished, but there are a total of three different tutorials for my geometric triangle earrings. This is all three pairs of finished earrings. I'd love to see what you've created using my tutorial! Send me an email, craftyladyabby@gmail.com , and I'll likely share your project here...with you permission of course. Happy making!